CLP is a small community school with a proud tradition of excellence and engagement. Located on the beautiful Cache La Poudre River, Cache La Poudre Middle School was built in 1949 to replace the existing school built in 1913. 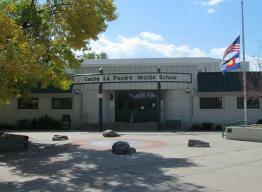 It was originally Cache La Poudre High School and became a Junior High in 1964 when Poudre High School was built. CLP is an authorized International Baccalaureate Middle Years Programme (IBMYP) School. CLP is a unique school in the Poudre School District as we serve 320 students. Our small community school prides itself on the relationships, often spanning generations, that we build and maintain with our students and families. The foundation of CLP is Respect: Respect for Ourselves, Respect for Others, and Respect for our Environment. As an IB school, CLP is dedicated to the holistic education of our students. Every student takes English, Math, Spanish, Social Studies, Science, Art and/or Music, PE, and Technology every year. Students experience an academically rigorous curriculum through inquiry learning. Students are taught to understand who they are as human beings and to engage in their local and global communities. A wide array of school clubs such as Chess, Fitness, Creative Writing, and Outdoor Education, Lego Robotics, NJHS, and Science Olympiad are also offered. The staff at CLP are dedicated to their academic, emotional, and physical growth and success of each and every student.